Your boat or yacht, while providing endless pleasure and relaxation, can become an expensive investment if you do not take care of it properly. It all comes down to regular maintenance, to the finest detail, if you want to preserve the life of your boat. This is where boat window film comes in – something that is needed, yet often overlooked! Dr. Window Tint has answered some FAQS to ensure that you know what type of film you need and why, as well as how to take care of your tinted windows. 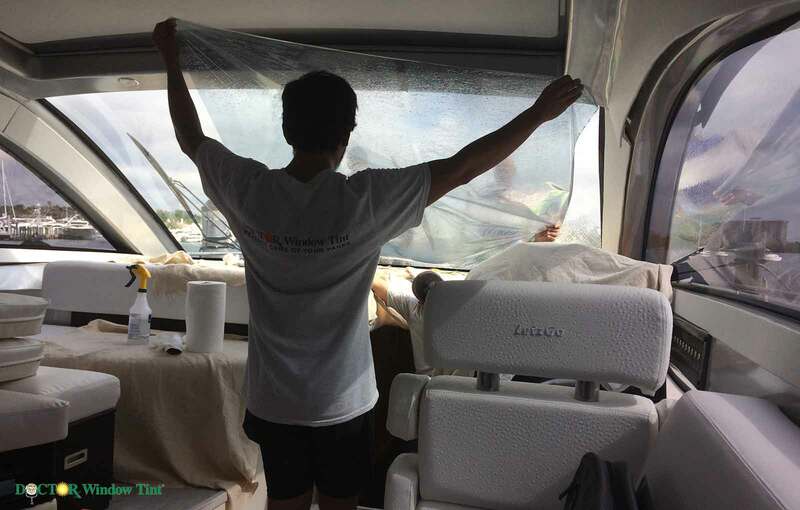 Why Do I Need To Tint My Boat/Yacht With Boat Window Film? Firstly, Window film reduces the glare of the sun’s rays, improving visibility and comfort for all boat passengers. Glare is not only uncomfortable, but it can also be dangerous, especially for the captain who is responsible for controlling the boat. With tinted windows, everyone can sit and enjoy the ride without having to squint away from the bright sunlight. Secondly, certain types of film also reduce the effects of UV damage upon the skin, hence reducing the risks of skin cancer and sunburn. UV damage can also cause any furniture inside your boat to fade, and so tinted windows can reduce UV damage to your boat, preserving it for longer. Thirdly, boat window film is also heat resistant, providing any boats with a cabin to be cooler and comfortable. Lastly, tinted windows can also give a sense of privacy and security, as it reduces visibility for anyone who is on the outside peering in. What Type Of Window Film Would I Need For My Boat? The type of film depends on what your requirements would be. Dr. Window Tint offers a few different types of tint, varying in function and price. For example, Economy Line is a tint that is commonly used for boat windows, as it is scratch resistant and reduces glare from the sun. A high-performance line offers the same as economy, but it also includes heat prevention and UV protection! How Dark Do I Need My Window Film To Be? That is entirely up to you, everyone has their own preferences. Dr. Window Tint has different shades ranging from 5% (the darkest shade) to 70% (the lightest, most transparent shade). If you want more privacy, we recommend darker shades to reduce visibility from the outside of the boat or yacht. Window tinting shades are measured by the amount of light that passes through your windows, i.e. visible light transmission. How Do I Install Window Film On My Boat Windows? Installing it yourself can be tricky, time-consuming, and it is likely to result in many bubbles appearing on the tint film. Installing window film takes lots of practice if you want a successful installation. Contact Dr. Window Tint to install your window film for you, as this will ensure that it is done correctly, saving you both time and effort. After Installing My Boat Window Film, How Long Must I Wait Until I Can Wash The Windows? Wait 3-5 days before putting any water or cleaning solution on your tinted windows, depending on how much sun exposure the windows have. If the windows have been exposed to the sun all day, then you only have to wait 3 days. If it barely has any sun exposure, it would be better to wait for 5 days. How Do I Take Care Of My Tinted Windows? Clean your tinted windows regularly with an ammonia free window cleaning solution as ammonia can damage your tinted film. You would need a bucket of water, cleaning solution or soap, a spray bottle, and 2 micro-fiber cloths. Mix the soap and water into the bucket and pour it into a spray bottle. Spray your window with the cleaning solution (the amount of soap and water mixed depends on the product, so look at the back of the product for instructions). You should dampen the first cloth for cleaning with the cleaning solution as well. After you have wiped the windows with the solution, use the second cloth for drying. Will The Salt Water Affect The Window Film On My Boat Windows? Film is usually installed on the windows from the inside of the boat, as it is then protected by the weathering elements from the outside. Water and salt from the sea can damage the tint if the window is tinted on the outside, reducing its effects and creating cracks and bubbles on the film. This means that it will not last as long, and can become costly in needing frequent replacements. How Do I Remove Bubbles On My Window Film? If bubbles start to appear on the film, take a credit card wrap it with a microfiber cloth. Press the edge of the card (covered in the cloth) against the window and push the bubbles to the corner of the film. Using your finger nails can also be effective, but take care not to scratch your film. However, thanks to the Dr. Window Tint unique 7 step installation process, bubbles will not be a concern if you use our experienced services. Now that you know a bit more about boat window film, contact Dr. Window Tint and make your boating experience better!